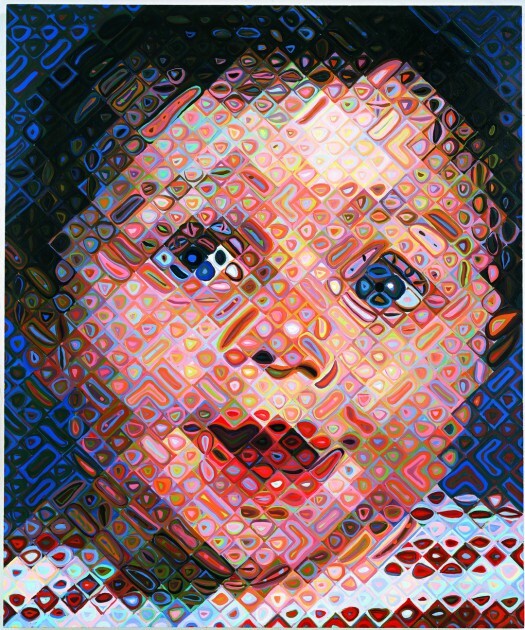 I can’t find an indication of which Jackson Pollock painting Chuck Close saw, but I think that there is a chance that it might have been Sea Change by Jackson Pollock (1947, shown above). 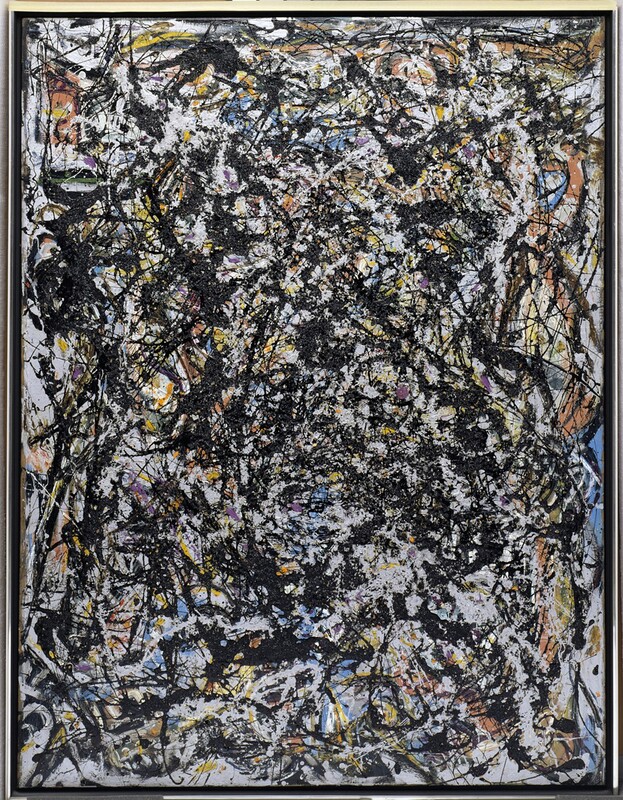 This painting was acquired by the Seattle Art Museum in 1958, but previously it was exhibited in 1955 at the SAM in a show called “Contemporary Trends in International Art” (April 7 – May 1, 1955). Since there is some uncertainty as to Chuck Close’s exact age when he saw a Pollock painting in the Seattle Art Museum (see first footnote), I want to propose that Sea Change is a viable possibility for the painting that influenced Close so much, even though Close would have been almost fifteen years old at the time (not eleven). When Chuck Close was eighteen, Sea Change (1947, shown above) entered the Seattle Art Museum’s permanent collection as a gift from Peggy Guggenheim. A fascinating side note: I found an fascinating transcript of the oral history of Edward B. Thomas, who used to work as a curator for the Seattle Art Museum. Thomas recounts his involvement in the museum’s acquisition of the painting Sea Change by Jackson Pollock. The painting was given to the museum as a gift from the art collector Peggy Guggenheim, under some very unusual circumstances. In essence, Edward Thomas was invited to dinner at Peggy Guggenheim’s palazzo in Venice, along with another dinner guest who appears to have been overbearing and rude. As a result, Peggy took a shine to the curator from Seattle, and at the end of the evening offered to let him select one of the Jackson Pollock paintings from her collection as a gift! Perhaps the Edward Thomas was drawn to selecting this Pollock, since it had just exhibited in Seattle a few years before? It seems likely to me. I’ve written elsewhere on this blog about Close’s change in style during his later years, which in some ways can relate to the fact that he is now bound to a wheelchair and suffers from a partially-mobile painting hand. 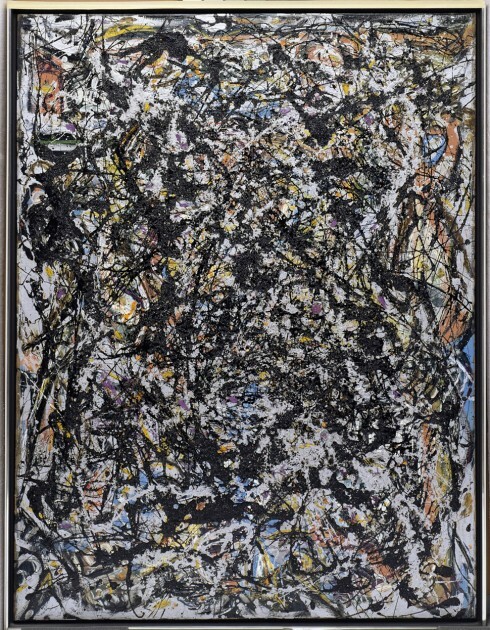 And now, while considering Close’s interest in Jackson Pollock, I like to think that Close is somehow indirectly inspired by his predecessor’s “action painting” more than ever, despite his own recent limitations in physical mobility. Go Chuck! 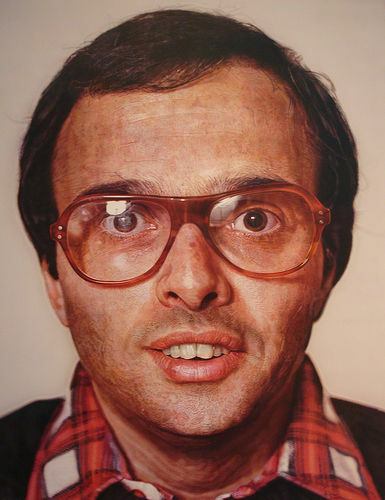 1 Phong Bui, “Chuck Close with Phong Bui,” The Brooklyn Rail, July 7, 2008. Available online: http://brooklynrail.org/2008/06/art/chuck-close-with-phong-bui. Elsewhere, another online source indicates that Close was fourteen (not eleven) when he saw the Pollock paintings, whereas another biography indicates Close probably saw the Jackson Pollock in 1953 (when he was thirteen). 2 Robert Storr, Chuck Close, Kirk Varnedoe, Deborah Wye, Chuck Close (New York: The Museum of Museum of Modern Art, 1998), p. 203. Available online HERE. I would have never guessed that Pollock was an influence of Close, but after reading this blog post I can see the connections you are making. Close’s later works in particular have a sense of movement and fluidity that hint at the dynamic action so prevalent in Pollocks works. They seem to vibrate in the same way.